So here was his response: "Thirty dollars." I should give some more clarity here. We have a 10,000+ square foot lot, and much of this area is in the front yard that was being discussed. This seemed pretty darn low, and our neighbor speaks English with a bit of an accent, so I repeated the offer just to make sure I had heard him right: "Thirty...three-zero." He agreed, yes, thirty dollars, and I said, "Sure! I have some bags and tools you can use if you need them." And I immediately felt like crap. Here is some more context, just to fully paint me as the villain. Our neighbor is an older gentleman, maybe in his sixties. He is of Latino descent, and speaks English with a bit of an accent, and he is one of those impossibly nice, always smiling people. He's a little guy, around five foot six, and as I looked out the window his age was showing a bit while he was slowly crouching down to put leaves and needles into garbage bags, all in the heat of an Arizona summer. After a few hours he was ready to leave and he said he'd come back to finish the next day. In my guilt I handed him over the $30 and thanked him, and he said he'd see us tomorrow. 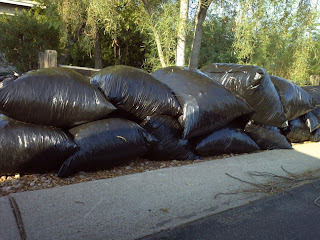 After three days, I had resigned myself to ironically having to actually work in the yard after paying someone else to do it, as there were piles of needles and leaves all over, just waiting for a storm to redistribute them over the property. But like our Lord and Savior, on the third day our neighbor returned and we were, at last, saved. Saved from the painful sting of yard work. I went outside and there was our neighbor, on his hands and knees, gently scraping the rocks underneath a tree with his little metal rake. Right away, he commented on how much work all this was: much more than he originally anticipated. And looking at him clean our yard, I caved: I agreed it was a lot of work...and we'd give him double the money. This is an obviously bad tactic: in a distributive or "fixed" negotiation, you should never improve the other party's position (a.k.a. "negotiating with yourself"). You should always make the other party state & improve their own position. But I felt bad. He's...old, like my grandpa...and working in the heat in his little straw hat...and...he's old! Like Jack Donaghy negotiating with his infant's nanny, I'd let my emotions get the best of me, and paid twice what we likely could have paid for the same services, without the other party even having to actually ask for more money. He rang the doorbell later that day, having done a pretty good if not perfect job, and I handed him the extra money and said "Thanks, the yard looks great." I'm not sure who really got the better end of the deal because, well, I haven't paid for landscaping before and I'm not entirely sure he actually does this sort of thing as a regular side hustle or not. Our neighbor seemed happy with the whole thing but who knows; the guy's always smiling so there's no telling. There are a few ways I can choose to feel about this whole experience. One lesson is that I should just embrace the fact that I don't need to maintain my lawn regularly, and to just do the minimum necessary to avoid citations from the city and cold stares from the neighbors. Or, maybe the lesson is that negotiations like this aren't really fixed. There is more at play than simply negotiating for the best value services at the lowest possible price: like our relationships with the people in our neighborhood and the feeling of paying a fair price for good work. Or, the lesson might be that letting emotions like guilt into negotiations isn't going to help your bottom line, and that in a free market we all need to advocate for our own positions. Or, maybe the lesson is that I need to either come to terms with the fact that we should outsource our yard work at a price we can live with, or learn how to find pleasure in maintaining our property. Maybe there isn't any lesson. But the yard looks nice for once and my neighbor made a few bucks and while I feel like a bit of a sucker, I don't feel guilty, and that's probably good enough. Interesting situation. I would guess that the guilt comes largely from watching a neighbor do it rather than paying a true professional. But it sounds like you guys were able to work out an arrangement that worked for both of you, even if you ended up paying more than you had to. And it's not like you signed a contract, so you're free to modify or eliminate the relationship going forward. That's true: I probably would've felt very differently watching a professional do it for the same price. The fact that I live up the street from him makes it a little more personal. I don't know how I'd feel about trying this again. I think I can safely say the "floor" is at least $60 now though. I wouldn't feel like a sucker. Paying a neighbor a little extra to a neighbor who worked in the blazing heat is probably better than feeling guilty or him feeling resentment. As for negotiating, it reminds me of the times I go to the carribean and asia (3rd world countries) and the tourists were always haggling with the locals when buying stuff or for services. I did a little too cause they inflate the prices. But some tourists really were fanatic. It was a difference of a few dollars and they would be intensely negotiating. Listen a few dollars to me is not a big deal compared to the local. I agree that the feeling of guilt isn't worth the extra $30. Though the bottom line doesn't particularly care how you got there, we're humans and it's important that we feel good about our actions, not just their results. Well first of all I think paying anyone to help you with the yard is a great idea if you can afford it. The time and disdain of doing it yourself it probably not worth it, yet having a nice yard can add a lot of curb appeal in the future. Plus your neighbors won't give you dirty looks. I wouldn't feel bad that he did it, but I'd maybe look around for the best deals on having someone work in your lawn maybe a couple times a month? This is definitely a tricky situation and I think I would have done the same. On the bright side, the list of learning moments you listed is great--you can take away a bit from each and every one of them for the next time you're in a similar situation with negotiating. Thank you, Jen. That's a positive outlook...when this happens again, maybe I'll come back to this post and try to learn a bit from the experience. I think you did the right thing. Everyone is happy in the end. Having a good neighbor is worth that much. Hi Joe! Thanks for stopping by. You're right, having a good neighbor & a good relationship's worth a lot. Thanks for the chuckle, Anna! I didn't know how that would go over...I have a weird sense of humor. I think I'm going to reconsider Betterment, thanks to your post. I had initially written them off since I think I can find lower fees directly at Vanguard, but that tax-advantaged rebalancing feature is really intriguing and may put Betterment ahead overall re: taxable accounts, due to the tax advantages. I think the lesson is that you should move! Who wants to work or shell out money for something of little value to them just to avoid judgment from others? Heck, you actually paid $295 for that work - $60 at 8% interest for just 20 years. We kicked yardwork to the curb when we moved to a home with au natural landscaping and left the neighborhood behind. Great for frugal (and lazy) living! Watering grass is ridiculous anyway, especially in Arizona! You can't eat it and it serves no practical purpose. That's true -- there are opportunity costs for that $60.